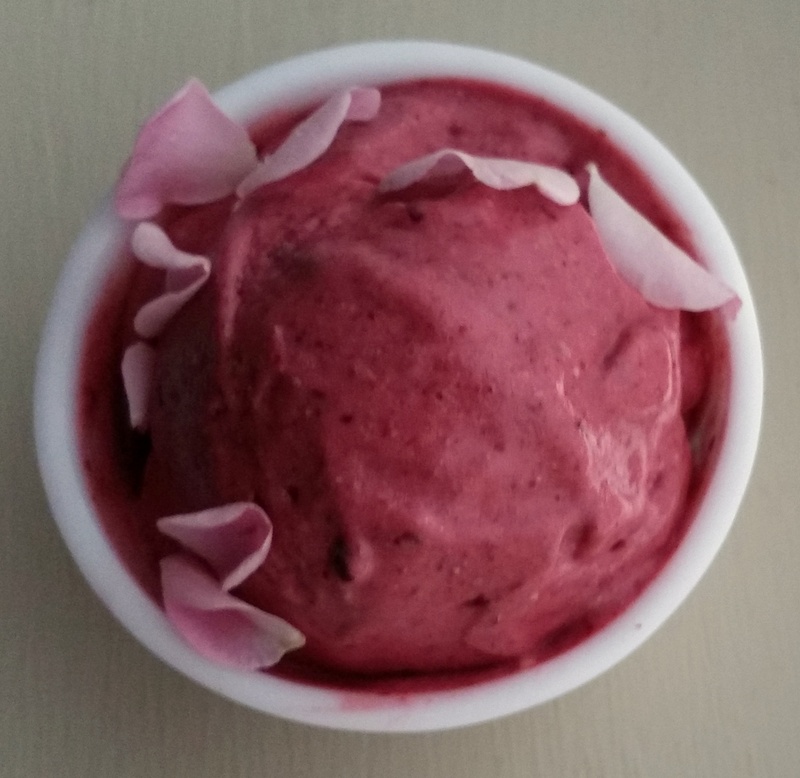 This ice cream features fruits, flowers and nuts from plants that are from the rose family, botanically speaking: strawberries, cherries, juneberries, almonds and, of course, roses. Notes on ingredients and substitutions are at the end. 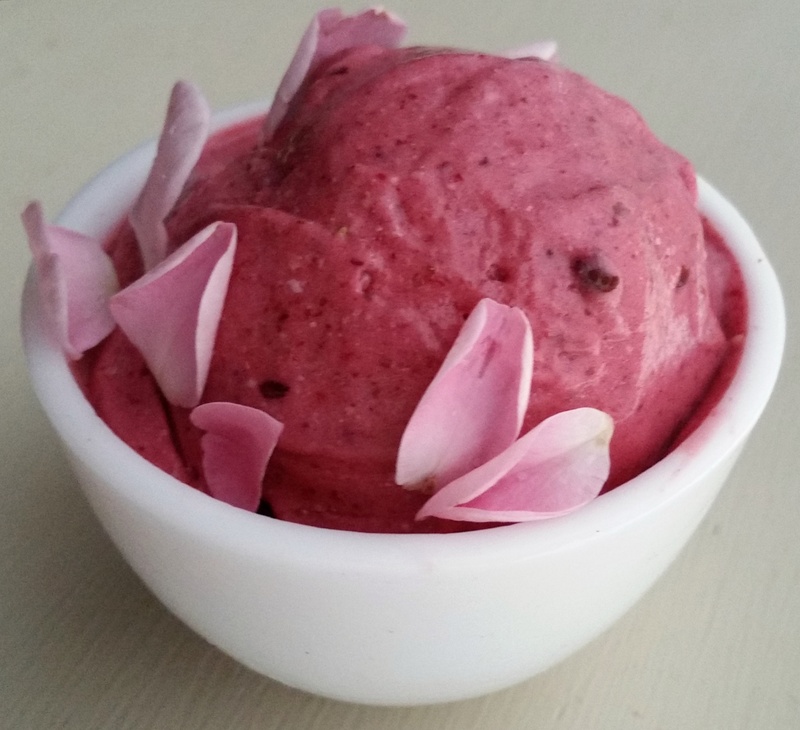 Put everything but the rosepetals in a blender or food processor (see my previous post for thoughts on blenders) and turn to high power following your blender manufacturer’s instructions. Use the blender’s tamper to force the ingredients into the blades as it blends. If your blender doesn’t have a tamper, turn the power off every 15 seconds to prod the chunks toward the blades and the smooth stuff away with a wood or plastic spoon. Remove the spoon, put the lid back on and star the motor up again. Blend until smooth (30 seconds to a minute in a Vitamix), but don’t overblend or it will start to melt. Scrape from the blender when it’s about the consistency of soft-serve. I use an ice cream scoop to make it pretty. If you want a firmer ice cream, stick your ice cream scoops in the freezer for a couple minutes before serving. Garnish with rose petals. I used fresh rose petals from my garden because I know where they’ve been. If you purchase your roses, get them from the produce section of your grocer. In the United States, edible flowers are usually packaged near the fresh herbs in small, clear plastic containers similar to berry containers. Do not use roses from the florist, since chemicals unsuited for consumption may have been used in the production of the flowers or after they were cut to prolong their display life. If you don’t have access to juneberries, substitute frozen pear pieces or frozen cubes of pear sauce in their place. The ice cream won’t be as rich a pink, but pear is another member of the rose family and highlights the floral taste of the rosewater. And if you’re really opposed to eating ice cream without dairy products, I guess you could substitute heavy cream for the coconut cream. Feel free to make it without the rose petals. 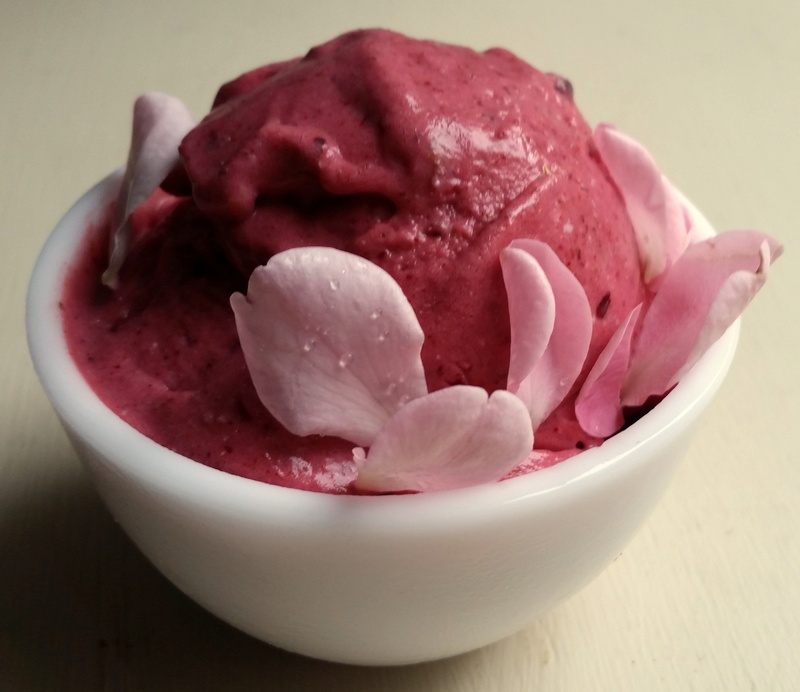 The rose taste really comes from the rose water -- rose petals on their own taste fairly neutral. Mostly they just add to the texture and appearance.